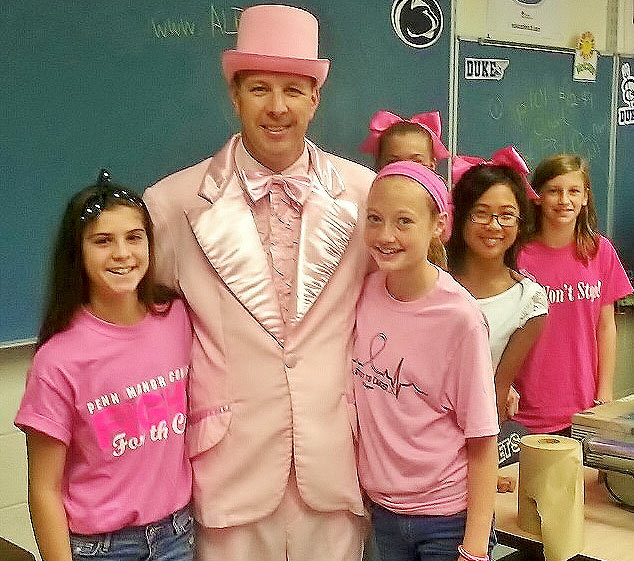 Penn Manor students and staff are celebrating today’s “Pink Out” by donning the signature color to raise money to fight cancer. 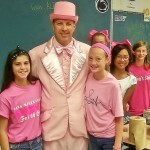 Nearly 1,600 “Penn Manor Comets FIGHT for the Cure” T-shirts have been sold as a fund-raiser, and the field hockey team exceeded its goal of raising more than $1,000. Other sports teams also raised money. 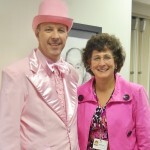 Superintendent Michael Leichliter agreed to wear a pink tuxedo, complete with top hat and shoes, for the day. Despite his getup, it was business as usual for the superintendent, who attended the Lancaster Chamber of Commerce & Industry’s advocacy meeting in downtown Lancaster Friday morning. 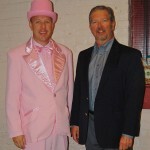 He’s pictured at the meeting with chamber board chairman Jim Adams. Dr. Leichliter also posed with students at Manor Middle School and with Vicki Hallock, Penn Manor’s supervisor of elementary education.